The appearance of your nails tends to tell others a lot about who you are as a person. Well groomed nails that routinely see a manicure tell others that you take good care of yourself. Nails that are rough and ragged might tell others that you worry a lot and you take that anxiety out on your nails on a daily basis. Splitting nails, however, will tell others that you need some help because you’ve let yourself go and stopped caring altogether. It’s really easy to point the blame for splitting nails at a specific lifestyle choice or dietary deficiency. One of the first things, in fact, that most people do when they start trying to fix their nails that have split is to eat more gelatin in their diet and begin taking an iron supplement. Eating a lot of cherry Jell-O and boosting your iron levels, however, isn’t really going to do a whole lot for your nails that have split. You see, there are three common reasons why you’ve got splitting nails. Here’s a hint: neither one has to do with whether you prefer to eat pudding over Jell-O as a treat! walking around with ultra-sweaty feet in shoes that are just a little too tight. All of this moisture works to literally degrade the cellular structure of your nail! Your nail begins to split because it is designed a lot like an arch. The highest level of moisture exposure typically occurs at the center of the nail and this degrades the arch of your nail at its pinnacle. As the cells begin to degrade, the strength of your nail begins to degrade with it. Eventually there just isn’t enough foundational strength to support the nail and that causes it to split! In many instances, a little better care is all that is needed in order to fix splitting nails under these circumstances. Trim off rugged edges that could catch on things, protect the split area of the nail from further injury, and be patient. It can take up to 6 months for a nail to grow fully from the cuticle to the tip. One of the easiest ways to add a splash of color to any outfit is to paint your nails. Unique nail patterns and colors also add a touch of personality to what the world sees about you every day and for many women (and even a growing number of guys), changing their nail color is about as common as changing into a new outfit every morning. It’s just become part of the routine. Did you know that both nail polish and nail polish removers can degrade the cellular structure of your nails as much as consistent moisture exposure can? Most nail polish removers also contain acetone, which over time can make your nails extremely brittle and cause them to crack. Alternatives generally include isopropyl alcohol, which isn’t as harsh as acetone, but will still cause brittleness when used extensively over time. Combine that with the nail polish that can also cause your nails to become brittle and it’s easy to see how a sensitive nail could want to split! Now nobody is saying that you shouldn’t paint your nails. We’re not even saying that you should get fake nails done instead of painting your nails because that’d be healthier for your nails – the verdict is still out on that one. What we’re saying is that if you’ve got splitting nails going on and you’re regularly painting your nails with your favorite polish, then maybe it’s time to give that practice a break for awhile so your nails can heal. Outside of moisture exposure and nail polishes and removers, the other common reason why splitting nails happen is because of a fungal infection. This kind of infection occurs if you’ve managed to get a nick in your nail that exposes your nail bed in a moisture-rich environment that has fungal spores. If you’ve got a gap in the tip of your nail and your nail bed, this can also cause an infection to begin developing if the fungus can get in there. What is a moisture-rich environment that would encourage the development of a fungal infection? For most people, it is a public or communal shower or bath that is the culprit. All it takes is for someone with a fungal infection to take a shower, combined with your nails having some sort of exposure to the nail bed, for an infection to develop under your nails. Over time, as the fungus expands and grows because it then is consistently exposed to a moisture-rich environment (which can just be you wearing socks and shoes every day), the affected nail will begin to lift up from the tip or the base, wherever the infection initially occurred. With enough uplift, there will be too much pressure placed on the arch of your nail. The most likely scenario is that your nail will split. It is also possible that the edges of your nail can pull out of the surrounding skin. For an unlucky few, both problems occur and it can become a very painful problem indeed! How Can a Fungal Infection Be Prevented? Most nail fungus infections can be prevented with just a few simple proactive measures. If you’re taking a shower in a public facility, wear a pair of sandals or flip-flops when you’re using it. Avoid contact with any of the fixtures outside of turning the water on and off, especially if there is noticeable water just sitting somewhere. Nail fungus also needs a warm, moisture-rich environment to grow and thrive. If you can keep your nails cool and dry, you’ll eliminate the conditions that are needed for your infection to establish itself. If you think you might have exposed yourself accidentally to a fungal infection, make sure to keep your feet especially cool and dry for a minimum of 72 hours. Even throwing on your shoes is enough of an environmental change to kickstart fungi growth under your nails! Eating a healthy diet that keeps your immune system strong can also help to keep a fungal infection at bay. Yogurt, garlic, oats, and barley are all great immune system boosters that can help your body recognize and quickly react to an infection that is trying to establish itself under your nail! Because the circulation down by your toes is especially weak, your immune system needs all the help it can get. You can provide that help by eating a consistent diet that is high in immune boosting properties. What If I’ve Already Got Splitting Nails? Have you got a nail that has split already and you know it isn’t from water exposure or from nail polish? Then there’s a pretty good chance that what you’ve got going on is a fungal infection under your nail. For peace of mind, you might want to schedule an appointment with your doctor just to talk about the problem, but for most people, treating the infection becomes a primary desire. If you’re looking to treat a fungal infection that has caused splitting nails, there are a number of routes you can go. You could ask your doctor for a prescription medication. You might pick up something like Tinactin over the counter at your local pharmacy. The problem with these, however, is that it can take them a long time to be effective at curing your infection. It can take up to 18 months to kill off nail fungus using these methods. Are they effective? Sure they are! But do you really want to wait over a year for your nails to begin healing themselves? That’s why there is ClearNail Pro+. It is an easy-to-use system that can clear up a nail infection in weeks instead of years. If you’re ready to get rid of your splitting nails, then it’s time to try ClearNail Pro+. Forget the pain and embarrassment that your split nails communicate to others. Repair and restore your nail health today! 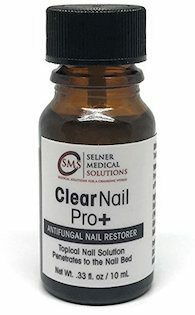 Order ClearNail Pro+ online now, direct from Amazon and get on top of your fungal nail infection.